Ex-Brumbies CEO Rob Clarke has paid tribute to former Wallabies, Waratahs and Brumbies star Dan Vickerman, who died at his family home in Sydney on Saturday night. Now chief operating officer of the Australian Rugby Union, Mr Clarke was in Canberra this morning to join ACT Sports Minister Yvette Berry, Brumbies halfback Tomas Cubelli and coach Stephen Larkham for an official announcement that the Wallabies will play Argentina’s Pumas in a rugby international here at GIO Stadium on September 16. The former advertising executive described Vickerman’s death as a tragedy, and acknowledged the difficulties many sportspeople face upon retiring from their careers. “I think it’s something that we as administrators need to continue be ever-vigilant with,” Mr Clarke said. He remembered Vickerman from his Brumbies days with fondness. “He was a gentle giant, a wonderful player, as you saw Phil Waugh’s comments today, about when you had Dan in a jersey running out beside you, you felt an extra level of confidence, and that was the sort of guy he was,” Mr Clarke said. Mr Clarke said both the ARU and the Rugby Union Players’ Association were working to support to members of the rugby community as they grieve for the former star. 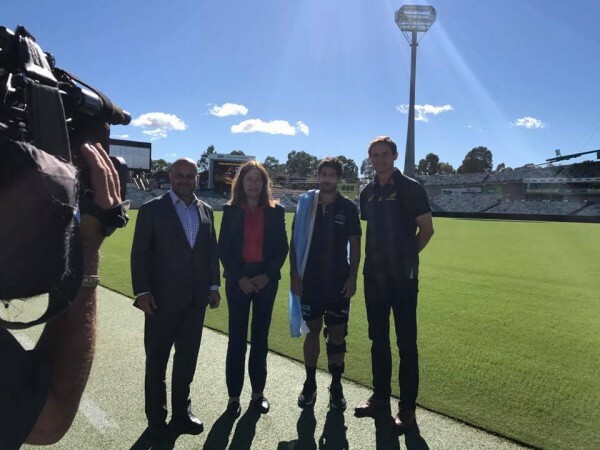 An offer for counselling had been put out to all players, particularly those who’d played with Vickerman at the Brumbies, Waratahs and Wallabies.